“I write things that I remember, that my Grandfather and Uncle Wat [Walter] Austin told me, when I was a boy. What I write, I remember well, being 10 or 12 years old. My Great Grandfather was banished from England, to the Colonies, in America for killing a man. The circumstances were about this. The people of England were divided, in their opinion, about witches, hobgoblins, and other scary things that appeared after dark. Some believed there was such things others did not. Grandfather, made fun of those who believed such nonsence [sic]. “One man said he would bet $100.00 dollars that no man could cross a certain old bridge, built on a milldam, that was said to be haunted; that no man could cross that bridge, after dark that he would be scared back, by scary things. “Now said he, ‘I will bet 100 dollars with any one, who will undertake it.’ Our Great Grandfather was then a young man, and was not afraid of anything. So he took their bet and the money was put up. When the day came there was a crowd on each side of the bridge, to see him cross. He was not allowed to have any weapons but a finger stone in each hand. “When he got about midway the bridge he saw a white object rise up before him. He stopped near the hobgoblin. He spoke in a loud voice, ‘Who comes there 3 times.’ Not a word was said. The thing stood still. It looked like a man wrapped in a white sheet. It stood in his way. He stepped a few steps nearer, and stopped. Now said he, ‘Man or spirit, or whoever you are, get out of my way. I am going to cross this bridge.’ But the thing stood still. He threw a rock. They heard the rock strike the ghost, and Mr. Ghost fell dead, and young Austin walked by him across the bridge, and won the money. Seen above is Pembury England where it all began. Mr. Harnson was a business associate of H.R. Latimer who was the director of the Horton Bank in Seattle. (Dexter Horton Bank, the first bank in Seattle, became Seafirst Bank and is now Bank of America). Harnson was presumably from Braddock, Pennsylvania and died on this day, July 27, 1904 (June 29, 1904 according to the Washington records) in the Golden North Hotel in Skagway of heart failure. His body was shipped back to Bradford, or Braddock, Pennsylvania for burial. Curiously, his friend’s employer, Dexter Horton the epitome of a rags-to-riches pioneer, died the next day, in his Seattle home on July 28, 1904. I have never heard of a ghost in the Golden North, aside from the made-up story of Mary the ghost. 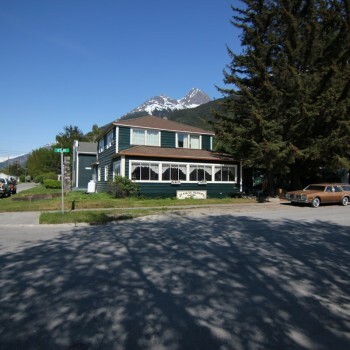 Skagway’s Alaskan Sojourn Hostel, which is situated in a local gold-rush-era house, recently had a guest report that he felt that his room had been visited by a benign ghost in the night. Although the identity of this ghost is well-known to the owners of the house, and ghost’s descendants in town, I am withholding the name out of respect for the family. Suffice it to say that it was a young man who tragically drowned at a young age in the early 1930s. The present owner of the house says that several years ago, she also saw the ghost calmly descending the stairs, and vanishing before it reached the last step. Elijah Baughman was born in 1859 in Oregon. He worked on ships all his life. 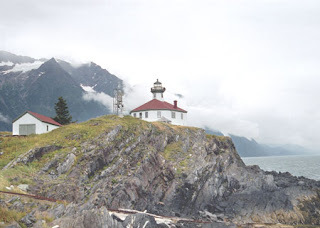 He commenced steamboating on the Puget Sound as a deckhand on the steamer Zephyr in the 1880’s, although he had previously had considerable experience on the Columbia River. After leaving the Zephyr he was mate on the steamers Chehalis, City of Quincy, and Washington. He was master of the steamer Eliza Anderson for three years. He was pilot on the ship City of Seattle for over two years (see previous blogs on the City of Seattle). While en route from Port Townsend to Seattle, Baughman was the pilot for Captain Gilboy, on the steamship Premier when it collided with the steamship Willamette off Marrowstone Point on October 8, 1892. It was a tragic accident. The 200-foot Premier with 70 passengers, collided with the freighter S.S. Willamette, that was outbound to San Francisco from Seattle with 2,700 tons of coal. Both vessels, proceeding “full ahead,” met in a thick fog that enveloped Admiralty Inlet and Puget Sound. The Willamette’s bow struck the Premier at a 45-degree angle on the port side, just opposite the pilot house, killing five persons and injuring 18. The hulls of the vessels became interlocked, making it impossible to separate. The Willamette finally pushed the sinking Premier across Admiralty Inlet, beaching her near Bush Point on Whidbey Island. Meanwhile, the passengers were able to climb from the Premier’s decks onto the bow of the Willamette. The tugboat Goliath arrived on scene a short time later, and took the surviving and dead passengers onboard, transporting them to Seattle. The Canadian Pacific Railway Company, owners of the Premier, patched up and towed the ship to Victoria B.C. 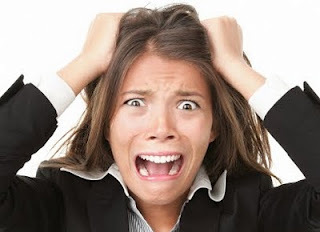 to escape the damage suits that were immediately filed against her. After being repaired, the vessel was renamed the Charmer, but never again ventured into American waters. It went from Victoria to Vancouver only. Seen above is the Humboldt in 1901 heading for Nome. Seen above is the Eldred (not Elder) Rock Lighthouse. The little note in my database just said J. Peraldi died on this day, April 14, 1898 at the Hotel Rosalie. (You would think this place got a bad rep for so many guys dying there). Hyacinthe Antoine Léon Peraldi de Comnene: Mining Engineer. It is sent by the government of the United States to Alaska to the search for gold mines. He died accidentally in Alaska, April 14, 1898. I think it loses something in the translation, but essentially he was a goldrusher whose family was in Philadelphia, apparently recently emigrated from Corsica. 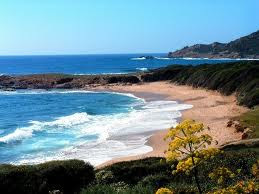 He was born in 1872 in Alata, a small town on the island of Corsica. Whether he was actually an engineer I don’t know, but his family thought enough of him to have his remains sent back to Philadelphia where he was buried with the other Peraldi de Comnene’s. There were references also to his family being among the personal enemies of Napoleon Bonaparte. Families left Europe for many reasons. Seen above is a view of Alata, Corsica. Walter was born in 1873 in Fredericton, New Brunswick. 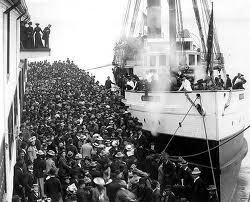 Although he was an accountant, he and his brother came west and were working on the ship Islander in 1898. 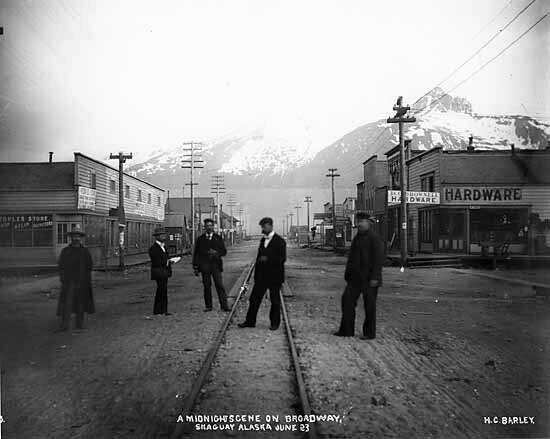 Walter contracted pneumonia while onboard and had to disembark in Skagway where he died in the Hotel Rosalie, on this day, April 8, 1898. His remains were taken to Victoria where he was buried. The Hotel Rosalie was located on the corner of Broadway and Bond (4th). It was a one room hotel where patrons curled up in corners. 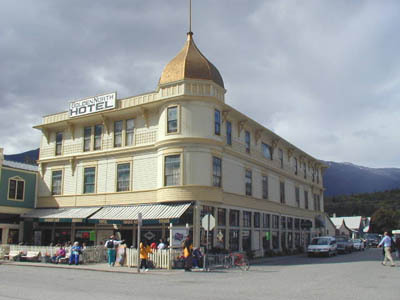 The building changed hands pretty soon after the Gold Rush and became Brownell’s Hardware Store. Then in 1903 Mr. John Anderson bought it and transformed it into the Pantheon Saloon. Charles Walker, who had done such a grand job of decorating the AB Hall, was hired to do the same with the saloon. Today you can see some of his artwork (restored by the Park Service) on the front of the Pantheon. In past years the Pantheon was leased to jewelers as part of the Klondike Gold Rush NHP’s leaseback program, but like many other businesses on Broadway this summer, it has gone vacant and will be used for meetings/training again this summer. Several years ago, I worked in this building and I can say I never saw or felt the ghost of poor Mr. Chestnut, perhaps he just wanted out of here. Seen above is the building – labeled Hardware Store. The photo was taken at midnight in June by Barley. Skagway Death Record; Victoria Daily Colonist April 15, 1898. Albert J. Goddard was an engine designer from Iowa who saw an opportunity to cash in on the gold rush. 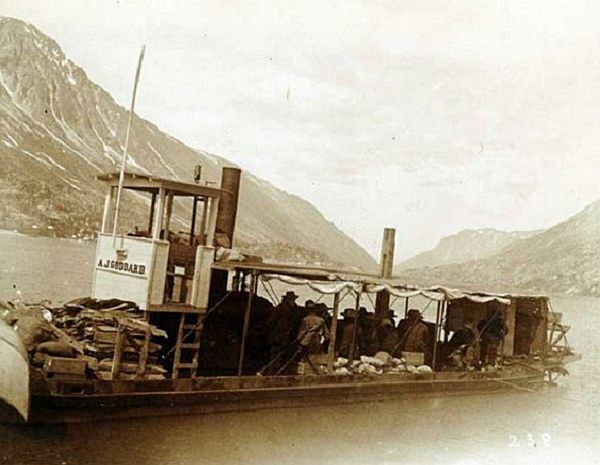 With the help of his wife, Clara, Goddard planned to take two steamboats into the Yukon over the White Pass during the winter of 1897 so that they could take the first cargo down the river in the spring. The little “A.J. Goddard” was prefabricated in San Francisco and Seattle. But Goddard discovered that moving the boats over the pass was not as easy as he thought. 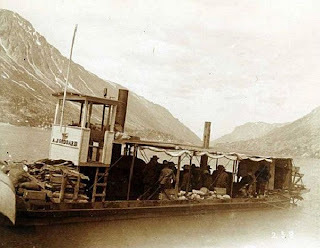 He and his wife were forced to move the vessels in bits and pieces across the steep White Pass, a job that took the entire winter, forcing them to endure deathly cold and physical exhaustion. The Goddards’ determination paid out in the end, as they established the first steamboat link between the gold fields and the Pacific coast. After building the boats at Lake Bennett, they plied the Yukon River in 1898, and then left the Yukon in 1901 when the A.J. Goddard sank. In 2008 a Yukon River Survey team discovered the A.J.Goddard in 40 feet of water on Lake Laberge. It had foundered in a fall storm in 1901, sinking at the north end of the lake and killing three men. While diving on the boat, they saw two axes lying on the deck at the bow where they were dropped after the crew apparently cut away a barge in tow. One firebox door is open and stuffed with unburned wood, suggesting the crew tried to restart the boiler fire as the ship was foundering. Goddard died in 1958 at the age of 94. Clara the faithful wife died in 1953 at the age of 89. I guess hard work did not kill them. I am reminded of a ghost story I heard about ten years ago. A friend who was staying at Sheep Camp at the ranger cabin was getting ready to retire one night when she heard people outside. She heard a man saying to his wife, “Come on Clara, it’s not much further, we’re almost there…” My friend opened the door expecting to see them on the trail, but to her surprise, there was no one there, she looked up and down the trail. This story is true, my friend is a very sensible person who would not make up a story. 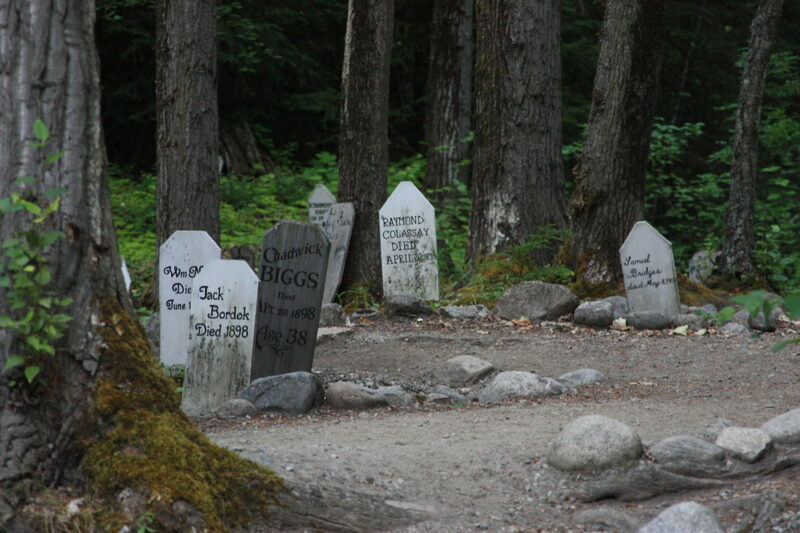 Of course that was the Chilkoot Trail and the Goddards used the White Pass trail, still…..
Pierre Berton; Daily Alaskan 1898; familysearch; online obit; Explorenorth.